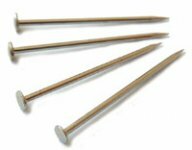 D3-001 - Body-Mounting Pins Set (for 2 cars) [D3-001] - $1.98 : TSR Slot Cars, TSR Slot Cars - Dedicated to Slot Car racing, collecting, restoration, track design, electronics and software. These selected plated-steel pins have a larger diameter and a wider head than common sewing pins, and are perfect fit in the typical body-mounting 1/16" brass tubing. This set fits 2 cars.